Putting the words "healthy" and "holiday" together seems a bit, well, silly. The holidays are a celebration and I love to forget about "healthy" this time of year. BUT, there is no reason to give up tasty food that will cut your calorie content and be enjoyable. 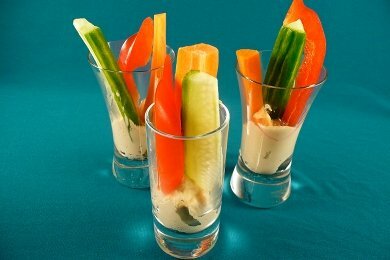 Hey, you are probably going to be making party appetizers anyway - toss in a few healthy ones and your guests won't even notice. The list below is a compilation of Snack Girl's greatest hits of the year. Most of them can be made in 10 minutes or less and feature fruits and vegetables. My favorite on the list is probably the figs dipped in chocolate with salt. These have helped me purge my obsession with salted chocolate caramels and made my trips to the dentist less terrifying. Please share your healthy ideas for the holiday party fest! We can all use them to keep it sane this holiday season. This is a GREAT idea! Will definitely be my next holiday party contribution.